At Droidcon a couple years back I had a go sitting in a chair while a camera was rotated around me to create a 3d model of myself. The company said they would give everyone a link to download the 3d models following the event, but disappointingly they never did, and they just ignored my attempts to contact them. This left me wanting a way to create a 3d model of myself… myself. 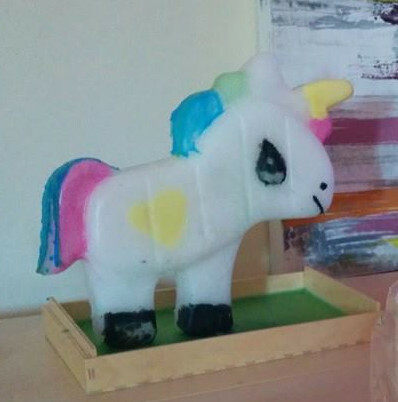 The most interesting object I could find in the house to scan was a Unicorn candle I made for my partner. It’s pretty simple to use, you take photos from several angles around the object (the app keeps track using the gyro) and then you select all the good images (delete blurred photos etc) and upload them. Note that the upload process can take a while as you are uploading 30-50 photos, and on top of that the server takes quite a while to create a 3d model out of all your images. If there is any interest I will make the .obj and .blend available for download. 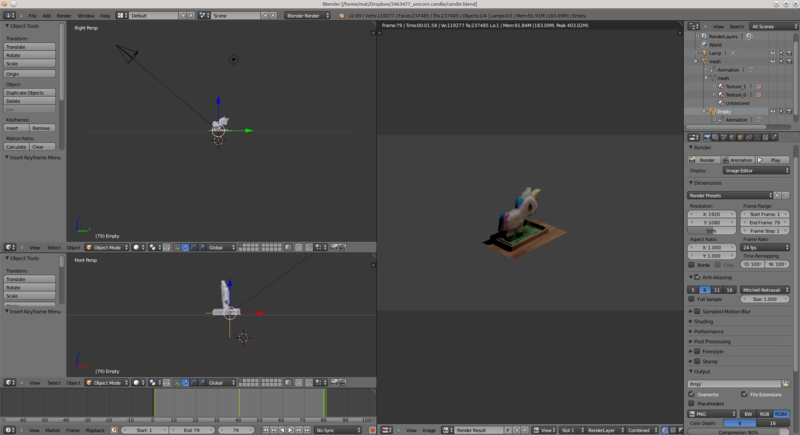 Blender wiki was invaluable, as it’s seemingly impossible to remember the keyboard shortcuts. I wanted to use blender to make a simple video rotating the camera around the object. Following this stackoverflow post it was quite simple. Creating a model of myself!! !